It’s that time of year – or will be soon – for newly purchased notebooks, sharpened pencils all accounted for, the thin lines of new whiteboard markers, washed desks awaiting handprints and chairs awaiting new friends. The time of year that is crisp with newness. The time of year that is so promising and idealic. The time of year when students return to your classroom – bright-eyed and bushy-tailed with chlorine and sun streaked through their hair, and smiles on their faces as they see their friends and teachers again. Teachers all over the country are beginning to think about going back to school. And even if you aren’t going back for a while, the summer unwind has taken place, you are recharged, and you are now able to start thinking about what you want to do differently next school year. You may have gone to a fantastic professional development session this summer, participated in some amazing twitter chats from your professional learning network, gone to a conference, or visited a teacher friend from across the country. All giving you new ideas and things to try for next year. How do you sort through all you want to do this year? 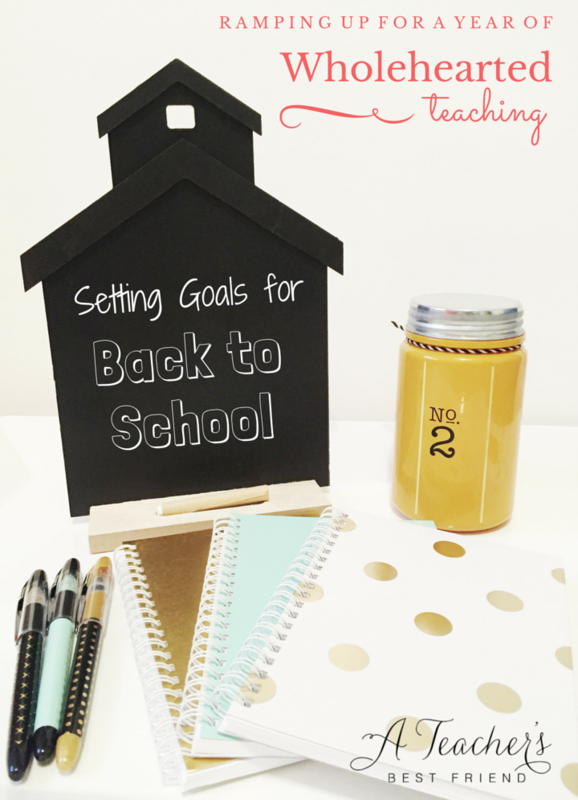 How do you set, maintain, and sustain your goals for going back to school? and create a plan for how to get there. It’s important to take very high-level 10,000 foot view look down at your life and career to begin the process for creating goals for going back to school. So to begin, I suggest you do some work on your personal vision statement. If you’ve never formally written a personal vision statement, I highly encourage you to slow down on this step and really think this one through. Visioning helps you to create a personal vision, which articulates the desired outcome for your life. You are the author – no one else. Your personal vision will help you to keep “the big picture” in mind when day-to-day stresses of the teaching profession arise. What do I enjoy most about my life (both in and out of school)? How does my role as teacher contribute to my life-purpose? How do my day-to-day decisions in and out of the classroom help me achieve my greater purpose? What do I need to accomplish in my career to feel that I’ve used my role/job/position positively and effectively toward my greater purpose? When you look at your answers to the above questions, you may see patterns or words and phrases that will help you to create one succinct and condensed personal vision statement. A personal vision statement can be a powerful device to remind you of your vision for your life’s purpose. It can become a mantra for you and can help you in making decisions about the ways you spend your time and energy (in and out of school). Stick your ideas on the whiteboard or on a large flat work surface. Now begin organizing them. You may start with organizing them into categories (like above or other categories that work for you). Put a #1 on goals that are easy to accomplish and are in line with your vision. Put a #2 on goals that are hard to accomplish and are in line with your vision. Here is an example: A teacher in Oregon has a personal vision statement to “use my passion in science and technology to inspire the students in my classes to be life-long learners who seek to know, improve, create, and innovate the world around them.” She completes the goal setting task outlined above and comes across this goal: “To participate in twitter chats twice a week with my PLN (professional learning network).” Depending on the type of twitter chat she engages in, this goal may or may not align and contribute to her overall vision. It’s also difficult for her to do because she has commitments in the evenings when the twitter chats happen. After considering this, she puts it down as in the #2 category. She knows that she can limit this to chats that are in line with her vision, but it would still be a difficult goal to attain. If it’s a worthwhile goal, she will have to determine if she needs to revise the goal to be more attainable. Here is another example: A teacher from Indiana has a personal vision statement to “lead, encourage, challenge, and inspire both his students and his family in order to seek their fullest potential” and he had a goal brainstormed to take on more committee leadership this year. Upon contemplating this goal, he realizes that increased committee time will mean that he will have less time to lesson plan, and less time with his family. Because both groups (his students and family) are more important to him than the leadership he would cultivate through the committee involvement, he decides to label it a #4. Now you need to decide which of the goals you’ve brainstormed and categorized you will actually do this year. It’s probably no secret why the goals are categorized into #1, #2, #3, and #4 categories per above. #1 are what I like to call the “No brainers” – they are easy to do and align to your vision. Go ahead and add those to the “To Accomplish This Year” pile. #2 goals are harder to accomplish, but may be worth it for accomplishing your broader vision. In this case, look at each goal and determine if it is worth it or not. This will require some tough decisions and intentionality. If you decide to keep it and put it in the “To Accomplish This Year” pile, then you need to be willing to commit to the hard work it will take to accomplish it. If you don’t feel inspired to commit, or you know it just isn’t a realistic goal, then consider revising it or setting it aside. #3 goals are easy, but aren’t necessarily contributing to your broader mission. Goals in this category may be tempting because they are things you can easily do – but if accomplishing them meant giving up on a #2 goal, would you still do it? If the answer is no, then put it aside. You can keep this as a “Nice to Accomplish but Not a Priority” pile. #4 goals are difficult to accomplish or ask you to sacrifice a lot AND they don’t contribute to your mission/vision. These are also “No Brainers” because they should really be taken off your plate altogether. In the case of our Indiana teacher, he may feel disappointed to say “no” when the sign up sheet for committee leadership comes around, but with this level of contemplation, he will feel much more confident in his decision, and will know that by saying “no” to this, he can say “yes” to something that brings him more fulfillment. Now that you have your goals written out. There may simply be too many to accomplish realistically. Look at those you have left and weed out (or readjust your expectations for) any that you simply realistically will not get to. For each that remain (hopefully no more than 2-3 in each category), develop them into S.M.A.R.T. goals. T = Time sensitive or time driven (give yourself a time frame). Here is an example of a SMART goal: I will create more work/life balance for myself this school year by leaving school 45 minutes after school lets out at least 3 days a week. This goals is specific – I will leave school 45 minutes after school lets out. The goal is measurable – I will know whether or not I made it by setting a timer and making sure I leave before the timer goes off. It is attainable – 45 minutes is enough time for me to do the essentials, plus I have 2 days a week where I can stay a little later for committees or planning. It is realistic because I know 45 minutes will give me enough time to get the essential things done and will force me to be efficient with my time. The goal is time sensitive because it is something I plan to do each week of this school year. Sometimes the T or the time sensitive part of the goal is the deadline for the goal (e.g. lose 10 pounds by March 1st.). So the T for some of your goals may be “by the end of the first semester” or “by the end of the school year” etc. Now that you have a few SMART goals for the year, you need to create a plan for attaining them. This is the part of the process that is most often overlooked. We set all kinds of goals for ourselves and then don’t set a plan in place for accomplishing them. Then the realities and stresses of the year hit, and we forgo or forget our goals. So, now you develop your goals into a plan similarly to how you craft a lesson plan. You have your end in mind, now figure out your daily, weekly, monthly, or quarterly goals to get there. Let’s say your professional development goal is to develop your skills with integrating technology into the classroom. First, figure out what some tasks are to accomplish that goal. Perhaps the tasks are (1) learn about different modes of technology integration and gather ideas, (2) pick and idea you would like to try and learn more about it if necessary, (3) implement the idea, (4) reflect on your practice to determine if you need to adjust or gather more information, (5) make the adjustment or gather the information, (6) try the technique again, reflect, adjust, and continue monitoring. Since there are 6 phases to this goal, you may want to split them up over the year. So say by December break, you will have done steps 1-4, then in January through April you can do steps 5 and 6 and make the technique a regular part of your teaching practice. Note: If you are required to do yearly professional improvement goals for your school or district, this is a perfect opportunity to begin planning these out. Don’t ADD another goal to your plate when goal-setting time comes. Just pick one of these to make part of your official professional improvement plan. I can’t wait for to see what’s in store for you this year! With wholehearted teaching as your goal – this school year is sure to be a great one!